Cheesecakes and sticky chocolate cakes are great desserts, and this book will give you recipes for all sorts of cheesecakes – classic as well as No-Bake, frozen, fast ones, and ice cube tray cheesecakes. The sticky chocolate cakes in the book include truffle style cakes, sticky apple pie, muffins, white chocolate cakes, chick pea cakes and much more. The cakes are flavoured using berries, chocolate, candy, Nutella, popcorn, dulce de leche and much more! 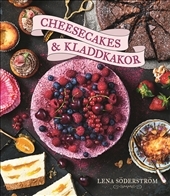 The author, Lena Söderström, is a master at creating tasty, fun and original recipes, with incredibly inspiring images.